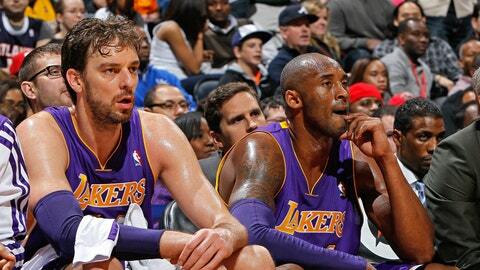 Pau Gasol and Kobe Bryant have been Lakers teammates since 2008. Even while recovering from his second injury in less than a year, Kobe Bryant still has time to find his sense of humor. Bryant, who’s currently working to return from a knee injury suffered in early December after rehabbing from Achilles tendon surgery in the offseason, won’t be on the Team USA roster for the 2016 Olympics on Brazil. Bryant, who recently fired a friendly shot at Rajon Rondo, signed a two-year, $48.5 million contract extension in late November and will not return to active duty until at least February.